Our galvanised wire rope range is extensive and loaded with different products, including this 11mm example of the popular 1×19 construction configuration. Get the lowdown on what this 11mm 1×19 Galvanised wire rope can do right here, then contact us for a quote. A lot of the specifications of a wire rope are wrapped up in its strand structure. 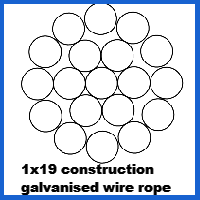 With the 1×19 arrangement of galvanised wires that come together to form this 11mm rope, you get load limits of 12,692kg and breaking force ratings of 124.5kN. Because the strands are organised in a fairly straightforward way, you can also expect a good deal of stretch resistance. This rope will be tough to break and will thus survive longer in standard use scenarios. The galvanising of the wires makes them able to avoid becoming corroded by rain, salt water and generally moist environments. From marine use to architectural deployment, such benefits will be a big selling point. Rope Services Direct has all the production facilities and equipment required to take a 1×19 galvanised rope and kit it out with components to craft an impactful, totally custom assembly. Our line up of high quality fittings and our general engineering expertise means that you can ask us to build almost anything using wire rope and we will oblige. One way to get more product info and place an order is to call 01384 78004 and have a conversation with an RSD sales representative. Another option is to email us with your query. 11mm 1x19 Galvanised Wire Rope Overall rating: 5 out of 5 based on 6 reviews.